Je suis arrivé* à Montréal Thursday night, and in typical me-style, sans a place to stay for the night. Luckily, the airport had wi-fi and I was able to find and call a hostel, Auberge de jeunesse, which saved a bed for me. Easy. I spent yesterday exploring Montréal en pied, my favourite thing to do when I arrive in a new city. I saw landmarks like the Bell Centre, home of the Canadiens, and McGill and Concordia. I stopped by the jazz festival to listen to a few songs and take a rest from walking in the heat and humidity. I ate crêpes, of course. 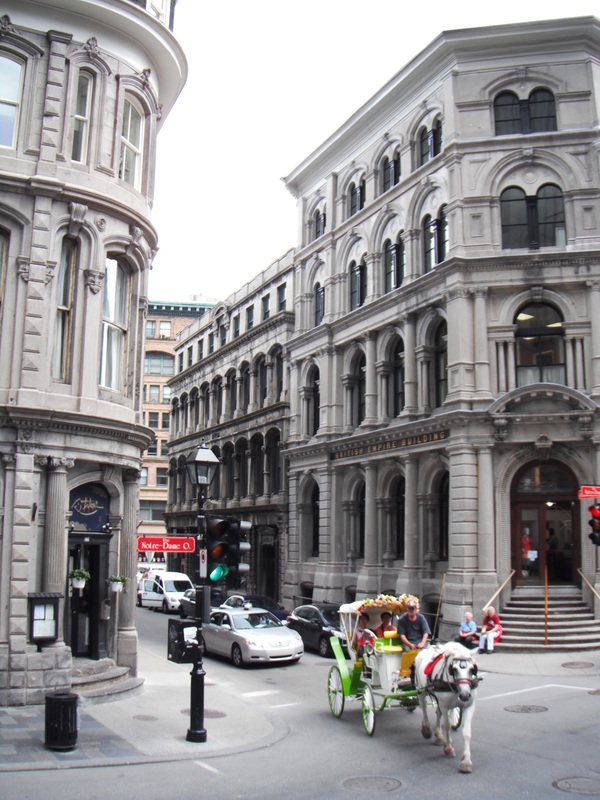 I walked around the very beautiful Vieux-Montréal (pictured). Continuing my world tour of subways, I took a short ride on Montréal`s metro. But by evening, it was time to leave on the Via Rail train that would take me to my final destination: Trois-Pistoles. This new adventure I`m embarking on is one in language, la français. I`m participating in the French language program offered by the Canadian government to students, so I`ve received a bursary to the University of Western Ontario`s immersion program here in Trois-Pistoles, PQ. I`m staying for five weeks -- and by the end I hope to be able to speak en français more fluently. I`ll be writing daily, with this complicated French-Canadian keyboard, to share my adventures and to map my progress. Allons-y! * And I have already made a French mistake: the title of this post should actually be Je suis arrivée! as I am, in fact, a woman. Je m`excuse!